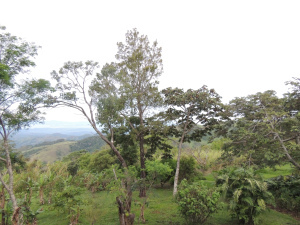 This series of blog posts chronicles the summer course that CURes offers for LMU students in Costa Rica called “Tropical Science and Culture in Costa Rica.” We teach this interdisciplinary overview of tropical science, policy, and culture course (and the interactions between them) in conjunction with the Monteverde Institute. The course consists of lectures as well as field visits and presentations. Students also develop specific areas of concentration for their studies by collaborating with course instructor, Dr. Peter Auger. 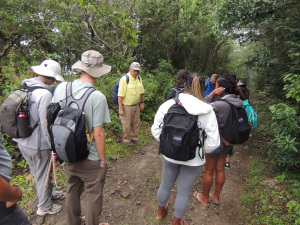 Overall, CURes and the Monteverde Institute aim to provide students with a broad Costa Rican historical and social context in order to facilitate a better understanding of the tropical biology of the region. To read more about the course, please visit the description on the CURes website. To read more of the blog entries from this year’s trip, please visit the LMU Costa Rica 2015 Blog. 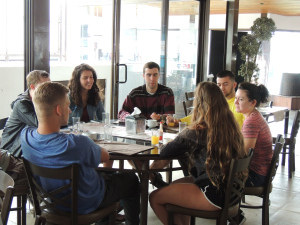 We began our day with a delicious breakfast, group meeting, and then headed out at around 8am on the bus to start our journey around Costa Rica by beginning the first leg heading north to Monteverde in the cloud forest. 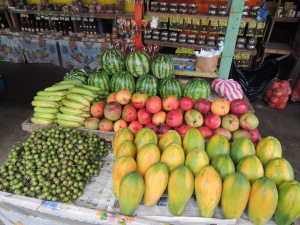 We had a very cultural stop on the way at a local fruit stand, where course participants tasted various local fruits. 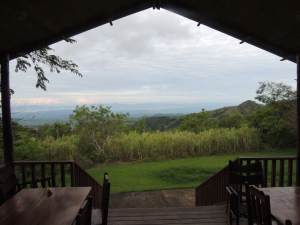 We then made it up to Monteverde and got unpacked and settled in at La Calandria field station, run by a wonderful couple (Nicolette and her husband). 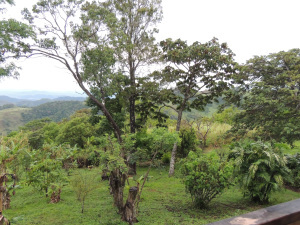 This is an amazing spot overlooking a beautiful valley with a body of water that is part of the Gulf of Nicoya, with spectacular scenery. For the first time for most, participants heard the rare Bellbird, saw a troop of female coatis cross our path, and spotted various bird species, including the Short-billed Pigeon Columba nigriostris and Masked Tityra Tityra semifasciata. This is an amazing place of beauty and biodiversity. Shortly after our arrival we got packed up for a trip into the town of Monteverde, where students were sent on a scavenger hunt to find certain things related to economics and culture in Costa Rica. After the scavenger hunt we headed back to the field station and discussed what students gathered in the scavenger hunt, from local fruits to pricing a meal. It was an awesome cultural exercise for participants. After our scavenger hunt group meeting we ate another delicious meal, and then gathered around in the dining area to hear an incredible presentation by Mark on, “The Natural History of Frog Calls”. 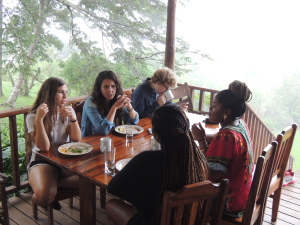 Students learned much information about frog vocalizations including how frogs make their calls, the various types of calls, and were introduced to a vast amount of species, some of which we may see during our course. 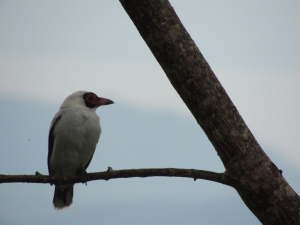 We were extremely fortunate this first day out on our journey, to see and hear several species of birds, including the Three-wattled Bellbird Procnias tricarunculata, the House Wren Trolodytes aedon, and the Laughing Falcon Herpetotheres cachinnaus. Below are links to 2 video clips – one containing pictures and sounds of a House Wren and a Bellbird vocalization at the end, and then just a vocalization of a Laughing Falcon. What a privilege to get so much exposure on our first day in the cloud forest! Good Morning from La Calandria! After our frog presentation last night we went out for a short night walk, and although we didn’t see any amphibians, we did see some cool insects and arachnids (harmless harvester spider)! After hopefully a good night’s rest, course participants will be making their way down to a different field station today, San Gerardo. We will start with a Bellbird walk (we can hear them this morning, and hopefully will see some), then will make our way to the Santa Elena Reserve and spend a couple of hours learning about and observing hummingbirds at their Hummingbird Gallery. From there it is a hike into the Children’s Eternal Rain Forest to the field station, where there is no internet service. No posts will be coming for a few days, but we will get caught up when we come out of the cloud forest. Pura Vida from the LMU group in Costa Rica! Is Mother’s Beach for the Birds?